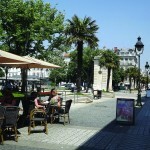 As a teenager I’d visited the historic port city and remembered it as a beautiful place. We snagged window seats at André, a famous seafood institution in the Old Port, and warded off the chill with bowls of fish soup, as briny as the sea. And so it was that I first heard of the Hermione. 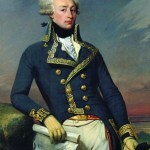 Pierre’s parents had read a local newspaper article about a project to reconstruct the frigate which carried the Marquis de Lafayette on his mission to aid the American revolutionaries in their fight for independence. The original Hermione was built at Rochefort in 1779, and the goal was to recreate the wooden tall ship using the same 18th-century technology and materials – such as oak, hemp ropes and linen sails. 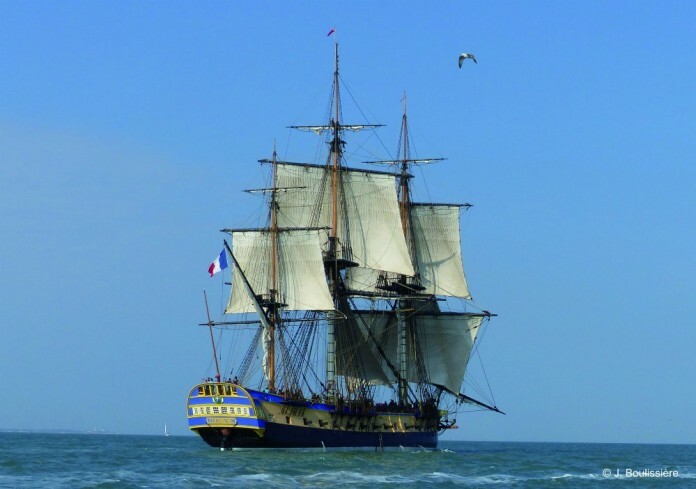 Eventually, the ‘new’ Hermione would set sail for America, recreating and commemorating Lafayette’s voyage of 1780. 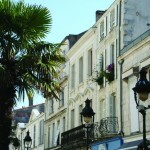 After lunch we headed south to Rochefort, just 37 kilometres from La Rochelle. The town’s claim to fame was its royal shipyard – King Louis XIV forever changed the destiny of les Rochefortais with an order to build “le plus bel arsenal” there in 1666. Jean-Baptiste Colbert, the Sun King’s Finance Minister, had recommended the site because of its ideal geographic position – sheltered by snake-like loops of the Charente River, some 30 kilometres from the Atlantic coast. Offshore, the islands of Aix, Madame, and Ré offered further protection from marauding invaders. Upon completion, the naval dockyards would be nicknamed ‘the Petite Versailles of the Sea’ and produced some 550 vessels which embodied the apex of technological prowess. 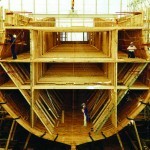 Stepping inside the dry dock, we were confronted with the massive skeleton of the ‘new’ Hermione. I’d never seen a hull so big in my life. Measuring 65 metres in length, it was crafted from 200 oak trees, individually selected from French forests because of the specific curvature of their trunks. Pedestrian walkways had been constructed adjacent to the hull so that visitors could watch the shipwrights at work. As we walked around the ship, I couldn’t help but wonder if the project would ever come to fruition. What a huge, glorious undertaking! I was utterly captivated. I grew up in Virginia, spending summers on the Chesapeake Bay, not far from Yorktown where the decisive battle of the Revolutionary War was fought, with the help of Lafayette’s French reinforcements. For me, the Hermione is a tangible reminder of this important shared history. She’s a symbolic link between continents, between the Old and New Worlds, between France and the young country which was born from French Enlightenment ideals and revolutionary thought. The project all started in 1992, when a group of passionate enthusiasts dreamt up the idea. Not only would the new Hermione revive the savoir faire of specialist artisans, but she could also shine the spotlight on Rochefort’s extraordinary maritime heritage. Construction got underway in 1997, thanks to line drawings created by the British Admiralty when the Hermione’s sister ship, La Concorde, was captured in 1783. The original Hermione was wrecked off the coast of Brittany in 1793, after a short but illustrious career. Over the course of 17 years, thousands of people have contributed financial donations to keep the project afloat and the total cost is estimated at €30 million. 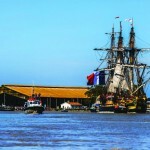 “We’ve almost finished recruiting all the volunteer crew members for the inaugural voyage,” explained Maryse Vital, the Director of the Association Hermione Lafayette, when I visited the shipyard again last May. I’d returned to Rochefort to witness progress on the Hermione, and it appeared that the project had defied the odds and was nearing completion. Indeed, a ‘tall ship’ of this size has never been recreated in France before. Painted in its original blue and gold colours, the Hermione soared 177 feet above her mooring. A lion figurehead, carved by sculptor Andrew Peters, adorned the prow. 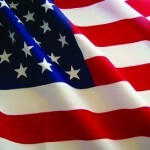 At the stern, a large French flag fluttered in the breeze. The 19 linen sails, encompassing over 1,000 square metres, had been hand-stitched by sailmaker Anne Renault. Scores of visitors walked through the museum, gaping at live demos of sail-making and carpentry. Costumed guides cracked jokes, and I even caught a concert. 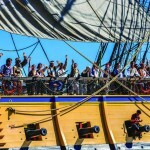 Stepping aboard the Hermione, I was impressed by the number of workers swarming the decks – attending to the winches, coiling the 26 kilometres of hemp lines, and assembling the beds and hammocks where the volunteer crew would sleep after their turns on duty. In Lafayette’s cabin, the walls were painted grey with white trim, and the parquet floors were as fine as would be found in a nobleman’s Parisian hôtel particulier. In just a matter of days, the 26 cannons would be arriving with much fanfare and celebration. They’d been cast by La Route des Tonneaux et Canons at Ruelle-sur- Touvre, some 130km distant, the same foundry which had supplied the original cannons. It was a sad chapter in Rochefort’s history when its naval dockyards were closed in 1927. There were even official threats to raze l’Arsenal Maritime de Rochefort, until it was classified “a historic monument in peril” under Culture Minister André Malraux. Thankfully, this pretty town turned to tourism for its economic survival. The Corderie Royale which, for two centuries, made the ropes for the French Navy’s tall ships, was converted into a museum in 1985. Today, visitors are immersed in the country’s maritime history via exhibitions, films and hands-on ateliers. However, Rochefort was really put back onto the map when the Hermione project first started to hit the headlines. Since the project was launched, her dockyard has welcomed over four million visitors. I’d returned to the region to witness this historic moment and, hopping on a ferry from Fouras, I reached the small, car-free island – a wind-swept paradise for its 213 inhabitants and summer visitors – in just 20 minutes. 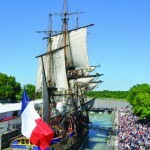 A rumour spread like wildfire – had mud in the Charente river prevented the Hermione from leaving? We waited with bated breath for a glimpse of the tall ship. 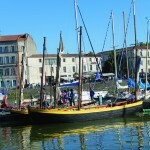 Hundreds of boats floated in front of the Île, where the Hermione was expected to anchor that night. I squinted towards the horizon, inhaling the salt sea air, then scanned the waves with binoculars pressed tightly to my face, feeling a bit like the scouts in the film Master and Commander, searching in vain for a phantom-like frigate. The sun was just starting to sink into the Atlantic, outlining the distinctive silhouette of Fort Boyard against the salmon-pink sky when, suddenly, the crowds erupted in applause, gesturing wildly towards the tall ship. I stood on tiptoe and, through my binoculars, spied the Hermione’s masts towering above a flotilla of boats. A news helicopter buzzed overhead. The Hermione was soon visible to the naked eye. She fired her cannons. The sun was hot on my face and tears slid down my cheeks. After the Hermione sailed to the Île d’Aix, she stayed at sea for two months, undergoing technical trials, during which she navigated the Atlantic coast from Brittany to Bordeaux, and fêtes were held in each port. At her helm was Yann Cariou, a French Navy veteran who oversees the Hermione’s crew of 18 professionals and 54 volunteers, selected after an intensive training programme. Over 900 people applied and their mettle was tested by such feats as climbing 47 metres to the crow’s nest. 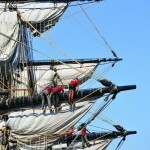 Being a crew member is physically exhausting – it takes an entire morning just to put up the Hermione’s sails. Working in four-hour shifts, the different teams share their mealtimes, sitting down to sup between the cannons, as did the original crew. Though built with 18th century technology, the Hermione is equipped with modern navigation systems and security. 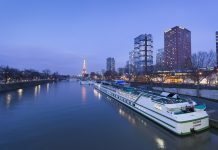 For the inaugural journey, she’ll also carry two barrels of Hennessy Cognac to be sold in the US – a symbolic gesture as, in 1794, it was one of the first maisons to export to the young country. It was a sultry summer day on the Chesapeake Bay and we’d come to historic Yorktown to soak up its history and stroll the waterfront promenade. The Riverwalk is a favourite visitor destination in Virginia’s Historic Triangle, which also includes Colonial Williamsburg and Jamestown, the first permanent English settlement in the US. Soon, our young daughters were clambering up a monument. Prominently positioned in front of the York River, the two bronze statues depict the meeting of important Revolutionary War leaders at Yorktown, namely General George Washington, who was in command of the Allied Ground Forces, and Admiral François de Grasse, responsible for the French fleet that controlled the local waters. Yorktown is excitedly anticipating the day – June 5, to be precise – when the Hermione will arrive in port. With this marvellous maritime adventure, the spirit of Lafayette lives on in the 21st century. Based in Paris, Nicklin is the Web Editor of France Today. She is also the Editor of Bonjour Paris, the site's sister publication. 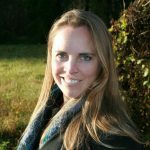 As a freelance journalist, she has contributed to publications like The Washington Post, Condé Nast Traveler, Rhapsody, Travel Agent Magazine, Luxury Travel Advisor, Afar and USAToday.com. 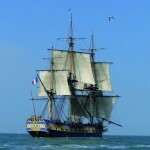 Lovely written article on The Hermione. Well written and touching. How fascinating! My son is in Paris studying and has had the pleasure of staying with a lovely French couple. The dinners his French mom puts on are a time to laugh and learn the beautiful French Language. In March, my husband and I had a dream week in Paris visiting my son. We were honored to be guests at my sons Host parents home and to enjoy one of those dinners. The warmth and wit in French and English was abound that evening. We hope to see the ship from Hermoine in Boston! Thank you! Where can I find the schedule of when this will be in Newport RI? What a beautiful, thrilling story! Having spent much of my youth in La Rochelle, the writer’s prose evoqued many memories of the sea, the air, Andre’s — but mostly of the the talented, vibrant people off the region. the massive French flag. It was a day very well spent. Merci mille fois. I was present when the Hermione sailed from Rochefort in April 2015. It was a glorious day. I got great views from the promenade at Fouras. It was a fantastic start to the transatlantic voyage. 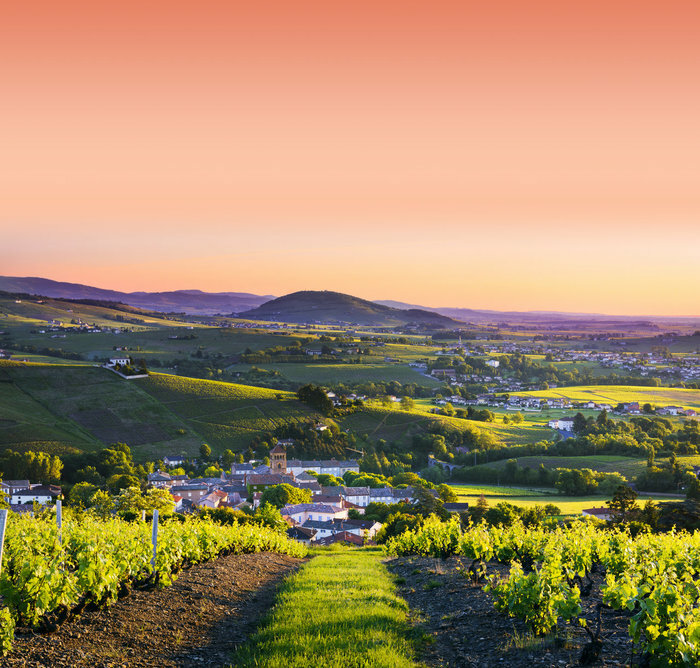 Discover a wonderful taste of France, at your own pace, with holidays carefully crafted to fit the most discerning holidaymaker.With over 32 years experience and expertise, we are the authentic French walking and cycling holiday specialist. More info.